Askmelah’s Notes: Maids are affordable and easily available in Singapore. With more and more children being served by the maids, it may spell the beginning of the downfall of Singapore with a whole new generation of softies. As of 2011, there are currently 201,000 maids working in Singapore. “Get a maid and spoil the kids” – The Sunday Times 4 Mar 2012, “Employ a maid and still have the kids help with the chores to instil in them a sense of responsibility. A friend said that is tantamount to spoiling the maid. In that case, I would rather spoil the maid than spoil the kids” – well said! 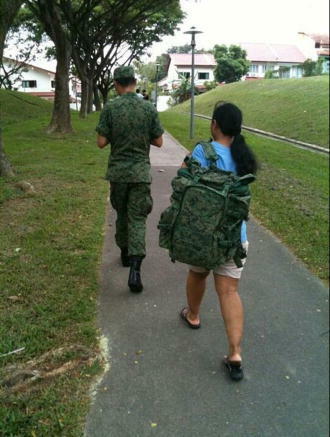 Photo of a maid who brings bag of a Singapore soldier became conversation in the country. Even, the photo had been subject to derision. “The story on the NSman who made his maid carry his field pack has sparked a series of parodies by netizens, proving that Singaporeans do have a quirky sense of humour.,” wrote Singapore’s lifestyle portal, STOMP, on Wednesday, March 30, 2011. “I had a great laugh when I saw these parodies!” commented one reader in the portal. In the website, there is also a “mood meter” to know how readers feel after enjoying the article. The first rank as much as 91% chose LOL! aka laughing out loud. The original photo was first sent by the reader of STOMP, Zhivago, who took it from the Facebook. I REFER to the report, “Maid jailed for killing employer’s 29 fish” (July 2). First of all, yes, what the maid did was wrong and she should be punished. If an employer scolds a maid in front of his child, is it a wise and right thing to do? If a maid is employed to look after a child when both parents are at work, she must have the authority to control and teach him. If a parent reprimands a maid in front of his child, what message is he sending to his child ? No wonder many of our children have become little “monsters” who show no respect for authority as evident in how they behave in school. If an employer has to reprimand a maid, it should not be done in a child’s presence. How should parents react when a child orders his maid to bring his new shoes into the flat? The parents should intervene and tell the child to bring them in himself, to teach him to be responsible and self-reliant. I have seen children blaming their maids when they did not bring their training shoes. This is the reason we now have a generation of young people who are treating the government like “maids”. What are we employing maids for? To be our slaves? No wonder we have a National Serviceman waiting at the MRT station for his maid to come and carry his backpack, while he walks back empty-handed.